Using data collected from sensors, infrastructure and networked devices, smart-city projects are helping municipalities improve efficiency, boost sustainability and encourage economic development. They are also creating more collaborative environments among cities and their businesses and residents. The smart-city market is in its early stages of development. Some of the most common applications include transportation and parking, energy management, water management, lighting, environmental monitoring, public safety and communications, waste management and smart buildings. The number of smart-city projects—and the number of companies and service providers involved with them—continues to grow. Partnerships between public and private entities will continue to be the primary development model for smart cities. Today, most applications of smart-city technology address one aspect of resource management. Over the next several years, the internet of things (IoT) is expected to evolve to a more sophisticated, networked ecosystem that brings these projects together and provides new combinations of valuable data. Smart cities have important implications for marketers and others seeking to use them as gateways for personalized services and platforms for targeted messaging. 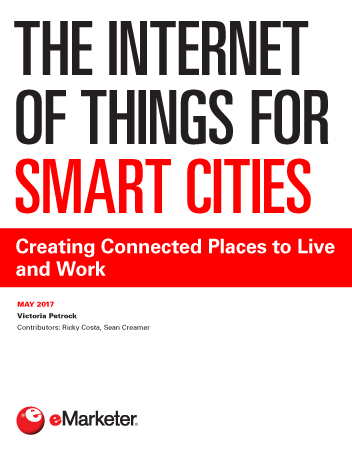 "An overwhelming majority of US municipal professionals believe that smart-city initiatives will be “transformational,” with positive, long-term impacts on cities around the world."